Video is a hardworking medium. If you plan it well, it can achieve many things for you. Just take a look at the examples below, which manage to enagage, intrigue, amuse and inspire all in less than 120 seconds. Always think how you can push your video content to do more. It's not about being unrealistic — it's about considering how and where you'll be using that content, and planning accordingly. Here are our hardworking selections for this week's Video Worth Sharing. Ikea have an upcoming collaboration. To promote it they created this strange, almost tactile teaser video. In terms of piquing interest and generating awareness we've never seen anything quite like it. Hats off to Ikea for doing something completely different and totally remarkable. 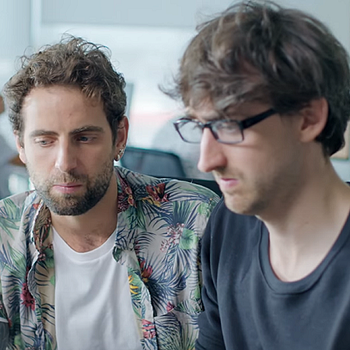 Equal parts painful and hilarious, this advert for Adobe Stock not only plays on the worst fears of its target audience of designers — it also expertly shows its services in action. You couldn't pack much more effective communication into 90 seconds if you tried. Human Rights are a pretty complex subject. But this colourful animation covers a quick summary of those rights, their history, and why they're so important all in under 2 minutes. It strikes a wonderful tone that's both amusing and inspirational.